Although it is well known that the literature on embroidery includes investigations into professional and amateur practice, the interaction between professional pattern drawers for embroidery, professional embroiderers and amateurs of this art remains to be fully examined. To this end, this object lesson examines a group of designs for embroidery in order to provide evidence of the technique for which they were employed; the dates and inscriptions on the designs demonstrate their use as a business archive, while the names of the clients reveal a social network. The final part of this article focusses on trade cards and suggests how the designs illuminate the negotiation between retailer and customer. The collection is rich in interest to historians of embroidery, suggestive of the clients served, though mute on many other questions. In particular, the designs do not easily demonstrate the difference between professional or amateur practice; but they do alert one to a business organization in which these formed a retailer's archive. Retailers employed professional pattern drawers and embroiderers in considerable numbers, with the latter supplying the growing ready-made market with fashionable needlework. The designs also give important examples of a significant fashion business with a bespoke service for an elite clientele. Studied in conjunction with trade cards, with more of their history revealed, the designs demonstrate how such clients shopped for embroidered dress in the last decades of the eighteenth century and suggest how their aesthetic and fashion desires were served through embroidered design. The designs and textile will be in a display entitled "Lady Middleton's pattern; Designs for embroidered Fashion, 1782-1794", from 8 November 2006 until 28 January 2007 in Room 102 on Level 3 of the Victoria and Albert Museum. 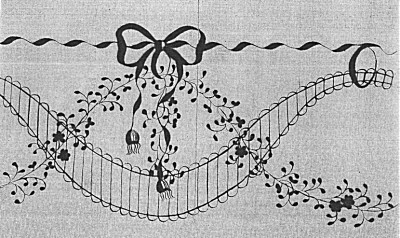 Anonymous, design for the border of an embroidered petticoat to an open gown or for the gown itself, pen and ink on paper, 20,2 x 32,1 cm (Victoria and Albert Museum E.225-1973, E.226-1973). Inscribed on the back "The Hon ble Miss Holroyd With Miss Emily's Compts" "Lady Middleton's pattern give to Miss Emily Pelham Sep. 12 1788", The patern was acquired in two pieces and was joined together as a result of the research on this project.